One of the most popular terrier breeds still used for hunting today. 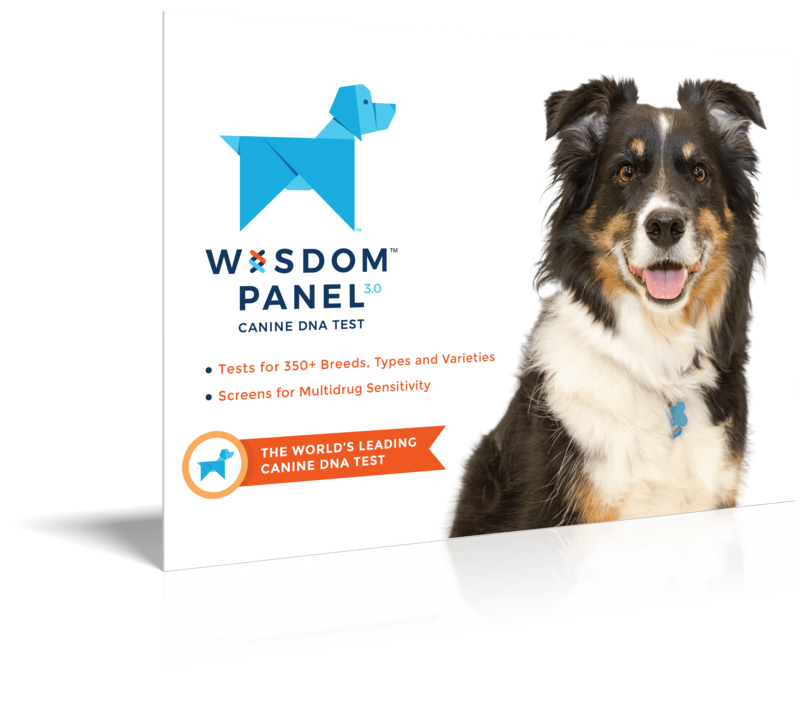 Usually very easy to train and are eager to please, with a typical terrier temperament. 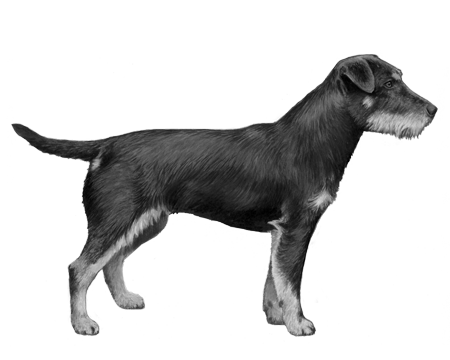 A remarkable working dog with great intelligence, fantastic drive and agility, the German Hunting Terrier is also known as the Jagdterrier. One of the most popular terrier breeds still used for hunting today, they are unique in that that they excel at pursuing their quarry both above and below ground. 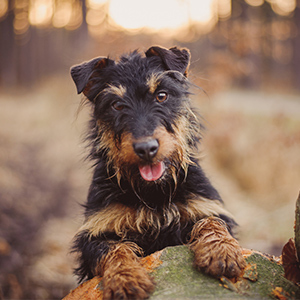 Even though small Black and Tan terriers have existed in Germany since at least the 18th century, this breed was created just recently in the 1920's. As the story goes, there was a group of Fox Terrier fanciers that decided to abandon their investment in the English breed because they thought it was losing its hunting abilities, and instead begin crossing suitable rough-coated English Fox Terriers, Welsh Terriers and Old English "broken-haired" Terriers. There is some uncertainty concerning the full story behind the crossing as many of the documentation was lost during World War II, but one thing is for sure, this is a terrier breed through and through with rumours of as many as 10 additional terrier breeds contributing to it at one time or another. 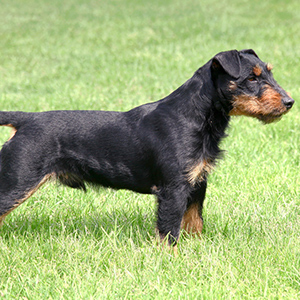 Rumoured or not, due to the large number of contributing breeds, in the early days there was a wide variety of sizes and colourings noted for the German Hunting Terrier, so a decision was finally made to select for a specific coat colour alongside the preferred drive, tenacity and health requirements. 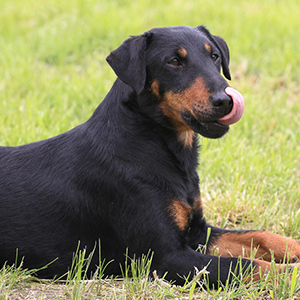 A typical dog of this breed is black and tan, with the tan being more of a rust colour on the muzzle and undercarriage. 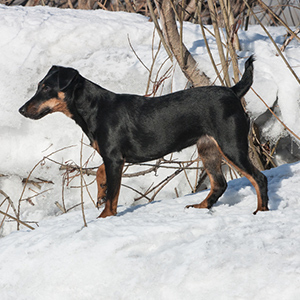 A German Hunting Terrier’s coat can be either wiry, smooth, or broken. Intelligent, courageous, and exceptional hunting companions and retrievers, it’s no wonder this spritely breed has become a favourite among terrier enthusiast.